The Government’s motion raised two abstract questions of constitutional law. The first question was whether the Constitutional Court handles the so-called enhanced cooperations similar to the present agreement as part of the EU-law, or treats them as agreements concluded on the basis of international law. In the framework of this review, the Constitutional Court recalled: as established in the Decision No. 22/2016. (XII. 5.) AB, by joining the European Union, Hungary has not given up its sovereignty but it only allowed for the joint exercising of certain powers, accordingly, the maintaining of Hungary’s sovereignty should be presumed in the course of assessing the joint exercising of powers additional to the rights and obligations specified in the founding treaties of the European Union (the so-called presumption of maintained sovereignty). According to the Constitutional Court, the form of enhanced cooperation should enjoy special consideration under public law. Hungary is free to conclude an international treaty the only states parties of which are Member States of the European Union and which creates an institution that applies the law of the European Union, however, all this shall only become part of the EU-law, if its legal basis can be found in the founding treaties. This should be examined by the Government in the case of the concrete cooperation. If in the present case the Government holds that the founding treaties of the European Union have already specified the power related to establishing the institution concerned, the legal basis of the publication of the implementing international treaty shall be Article E of the Fundamental Law, while in other cases the legal basis shall be Article Q of the Fundamental Law. The other question to be answered concerned the conditions of validity necessary for the publication in case of an agreement under international law. In addressing this, the Constitutional Court first considered that the Unified Patent Court to be set up shall apply in its procedure not only the EU-law but also the national laws of the Member States. The Constitutional Court also recalled that the international agreements establishing judicial fora typically set up a forum with a special function of legal remedy. However, it is a peculiar feature of the international special court set up for specific case-groups that not only the appeal procedure but also the basic case shall be dealt with by the special court. Therefore the operation of such an international forum supplementing the national court structure would result in drawing the relevant legal disputes between private parties off the jurisdiction of the national courts, which would necessarily affect the Fundamental Law’s chapter dealing with the courts in Hungary. The Fundamental Law prescribes, by allowing no exception, that the national courts shall decide in all legal disputes of private law. The Constitutional Court concluded from the above that, according to the provisions of the Fundamental Law in force, the international agreement transferring to an international institution the jurisdiction of adjudicating a group of private law disputes may not be published. 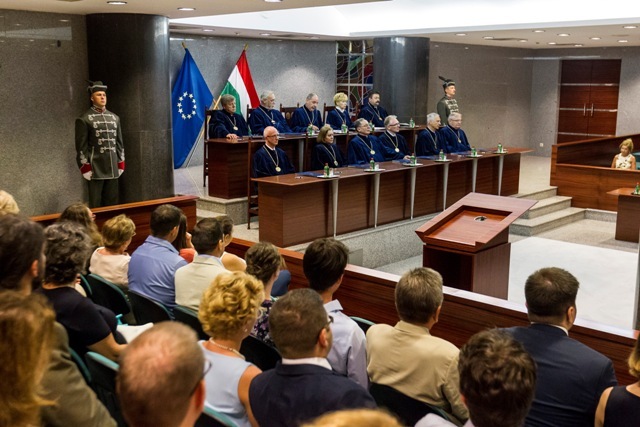 The full text of the decision is available on the Constitutional Court’s website (alkotmanybirosag.hu). Judge Dr. Béla Pokol attached a concurring opinion, while Judges Dr. Egon Dienes-Oehm and Dr. István Stumpf attached dissenting opinions to the decision.